Counting Thyme by Melanie Conklin. Grades 4-7. Putnam, April 2016. 320 pages. Reviewed from ARC provided by publisher. Cancer is the worst. Because of cancer, specifically her five year old brother's cancer, Thyme (that's Thyme with an HY like the herb) and her family have picked up and moved across the country, leaving California for New York City where there's an experimental treatment that might help her brother. 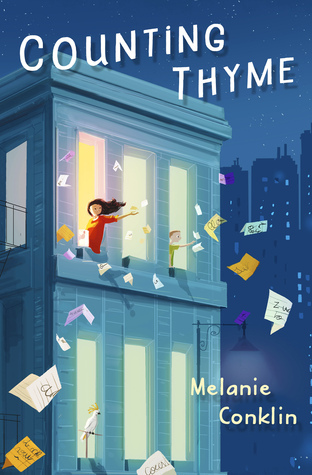 In New York, Thyme has to share a bedroom with her moody older sister, they deal with a total crab of a neighbor who's always complaining that they're too loud, and Thyme has to start over in a middle school where she knows no one. Thyme has no interest in building a life here. The treatment is supposed to take three months and then Thyme is planning on being back home with her best friend, living in the house she's grown up in, going to the school that she knows. She is literally counting down the days and hoping that by doing chores and earning "time" (her parents' version of an allowance) that she hopes she can use to visit her best friend back home. But Thyme's parents aren't being completely honest with her. With cancer, there are no guarantees. And while Thyme will discover some things she likes about New York, like cutie Jake who seems to like her, too, and their housekeeper Mrs. Ravelli's amazing cooking, she's also going to have to accept that you can't always plan out your future. Combine the friendship story of Rebecca Stead's Goodbye Stranger and the sibling love of Jordan Sonnenblick's Drums, Girls, & Dangerous Pie and you have this book. It's both a poignant story of one family dealing with cancer and a story about girl who's navigating friendships and alliances as the new girl in school. It'll appeal both to readers who are interested in reading stories about kids dealing with cancer and fans of realistic friendship stories. I particularly appreciated seeing how different members of the Owens family dealt with Val's cancer. Although the story is told from Thyme's point of view, Melanie Conklin does a nice job of showing us how each member of the family is reacting, even if Thyme doesn't fully understand where everyone is coming from. The two books I mentioned above might make good readalikes, depending on what readers like about this story. Readers who are riveted by the frenemies, competition, and crushes that Thyme deals with at her new school may enjoy Rebecca Stead's Goodbye Stranger. Readers who love the relationship Thyme has with her little brother Val may enjoy Jordan Sonnenblick's Drums, Girls, & Dangerous Pie. Readers who enjoy reading about life in New York City might enjoy Liar & Spy by Rebecca Stead or Absolutely Almost by Lisa Graff, realistic novels with very different plots but a strong element of New York City apartment life.